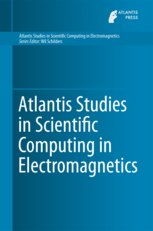 This series contains volumes on scientific computing for a wide range of electromagnetics problems. The electronics industry, in a very broad sense, is at the forefront of innovation and our daily life is very much dependent on achievements in this area. These are mainly enabled by rapid developments in sophisticated virtual design environments, numerical methods being at the core of these. Volumes in this series provide details on the modeling, analysis and simulation of problems, as well as on the design process of robust solution methods. Applications range from simple benchmark problems to industrial problems at the forefront of current research and development.